Show off your best work in an impressive custom leather presentation portfolio from Powell Leather! If you're looking for a custom leather tatoo artist's portfolio album, we've got just the book for you! Tatoo artists from all over the world have chosen Powell Leather to design and craft their custom leather tattoo portfolios. We will be pleased to fix your artwork or logo upon the cover leather of an album assembled from the leathers of your choice. Your art may be inlayed within the leather, or embroidered into the leather to create a beautiful book that will offer years and years of faithful service. Our professional presentation portfolios contain 8.5x11 pages which will easily accommodate your samples for your customers viewing. 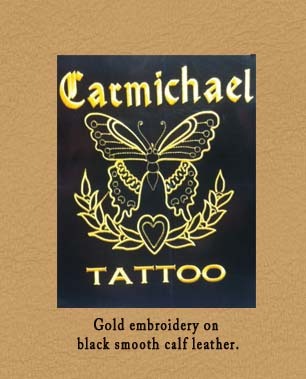 Please feel free to contact us to discuss how we might craft a one of a kind custom leather tatoo album for your shop.